In a large pot, sautee onion and garlic in extra virgin coconut oil until soft. 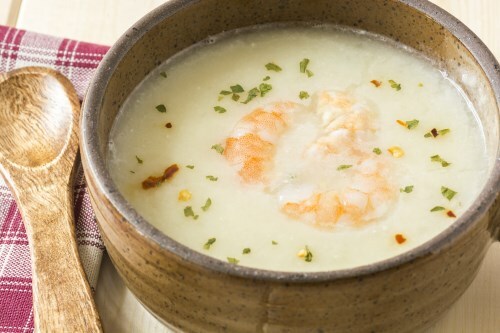 Add half of the shrimp, in a blender along with the eggs, coconut cream, white wine and fish stock. Add the onions and garlic and puree all. Add the mixture back to the pot and heat on low while stirring until the mixture thickens. Add old bay to taste. Add the other half of shrimp and heat until cooked through. (Can also cook these in the oven for a few mintues then add to the soup when cooked. ).